On Sunday, we went to the Where The Wild Things Are: Maurice Sendak In His Own Words and Pictures exhibition, at the Jewish Museum in St. Kilda. This exhibition was in its last day (it ran since July), so we had left it pretty late :). "An exhibition for people of all ages, a hands-on interaction with Sendak's stories and characters. Dress up like a Wild Thing, dance in the wild forest, cook in the Night Kitchen, read on Rosie's stoop, slide into a bowl of chicken soup, and create your own masterpieces while listening to classical music. The "voice" of the exhibition is Sendak himself and focuses on his lifework through the lens of his Jewish heritage." 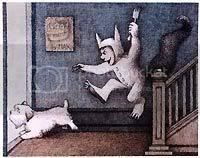 The Maurice Sendak exhibition was "organised by The Breman Museum, Atlanta, GA. Many of the images in this exhibition are facsimiles taken from the original art in the Maurice Sendak Archive housed at the Rosenbach Museum and Library, Philadelphia, PA."
The activities and displayed artwork were well organised, and there were many original pages of writing and some original sketches from notebooks in the cases. My major frustration was the size of the reproductions, which I felt misinformed viewers about the artist's working methods. These high quality facsimiles included complete layouts of pages, displaying the blue pencil line borders, black inkwork and even the pasted up type, but at a smaller size than the original. Most of the reproductions of finished illustrations were at the same, or a smaller size, than in the books themselves. 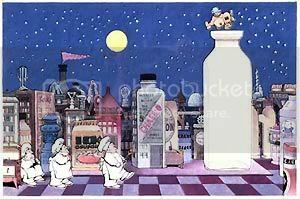 I would have liked the method of watercolour and acetate overlay on Night Kitchen made more clear, but was overjoyed to see that Winsor McCay's Little Nemo in Slumberland was displayed alongside, with clear recognition of the tribute Sendak was paying in his classic book. In terms of the work covered, the range went from Sendak's beginnings (and various continuing inspirations, both thematically and artistically), his work as an illustrator for other writers, his own first work (Where the Wild Things Are, which grew from Where the Wild Horses are) and many brilliant books, his illustration of classic works, his work design work for film, theatre and television, and the adaptations of Sendak's own work in various forms. The use of multimedia (particularly interviews and films such as The Sign on Rosie's Door, with music by Carole King) was well integrated. There was some focus on the fascinating theatrical background of Brundibar, also the final book Sendak illustrated. Some of the emphasis was different than I might have expected, with the first two parts of Sendak's classic trilogy, Wild Things and In the Night Kitchen, well represented, but Outside Over There largely passed over for display in favour of the illustrated version of the "found" Grimm story, Dear Mili. All this is nit-picking on my part. Maurice Sendak is surely one of the finest artists to ever work in children's books, and this exhibition was a good introduction to his work, particularly for children. For people interested, particularly if you don't already know Maurice Sendak's work, please check out the Media Resources page. Also highly recommended are Selma Lane's The Art of Maurice Sendak and Tony Kushner's more recent The Art of Maurice Sendak: 1980 to Present. I don't know if you can copyright a style but there are books in bookshops that shamelessly ape Sendak's style AND subject matter. PS We have In Grandpa's House, a great book.